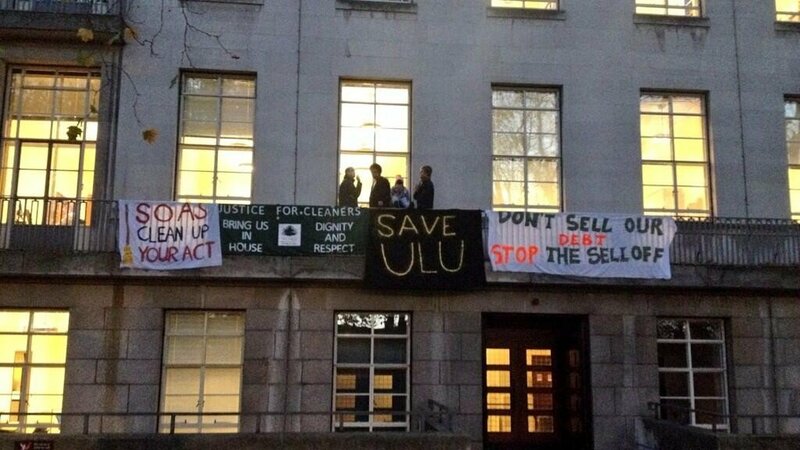 Dozens of protesting students occupied offices in Senate House in Bloomsbury, headquarters of the University of London, for several hours this afternoon before being ejected by police. The university should back higher education workers in their current pay dispute (there was a strike yesterday). The students entered at about 2.30pm and refused to leave when asked. Most staff in the area left although staff elsewhere in the building carried on working normally. The occupiers included students from University College London, SOAS, Royal Holloway and a variety of other colleges, including about five from Birkbeck. The area being occupied was a large horse-shoe shaped section with about 20 offices. Rosie Holland, a Royal Holloway student and one of the protesters, spoke to Lamp and Owl from inside the occupied area. She said the aims of the protest included to stop the university union being closed down, to get fairer rents for students in university accommodation, and to get the conditions for contract staff that they deserved. She said the protesters blamed the Vice-Chancellor, Professor Sir Adrian Smith, who was not present during the occupation, for the decisions on the ULU and staff pay, and that was why his office was targeted. “He is the one making the decisions,” she said. She said his office was “absolutely lovely”, with its own bathroom. As she spoke two security guards had locked themselves in this office, along with some other staff, and students were being refused entry. Rosie said the operation had been pre-planned and “quite easy”, and that the whole of the management corridor had been occupied. A burly security man had managed to “barge into” the management area before students had secured it. He and a colleague were the two locked in the Vice-Chancellor’s office, along with about 10 staff. In the early evening dozens of police arrived in about six vans. They gained entry to the area and the students were forced to leave. At least one person was thought to have been arrested amid clashes in the foyer and near the library. The building was cleared and locked up and police then faced dozens of chanting protesters outside the building. There were angry scenes and pushing and shoving of protesters by the police near Senate House and in the Malet Street area, while a police helicopter hovered overhead. Some protesters tried to barricade a street with wheelie bins to stop police vans moving through to pick up the officers at Senate House and more arrests appear to have been made. The police eventually left about 8.30pm. Occupations have been held at other universities and colleges recently including Goldsmiths, Sussex, Warwick, Liverpool, Ulster, Birmingham, Exeter and Sheffield. I am a freelance journalist and a student at Birkbeck College, studying web design.